I was excited Jaxson was coming home, but I was unsure of my ability to take care of him. 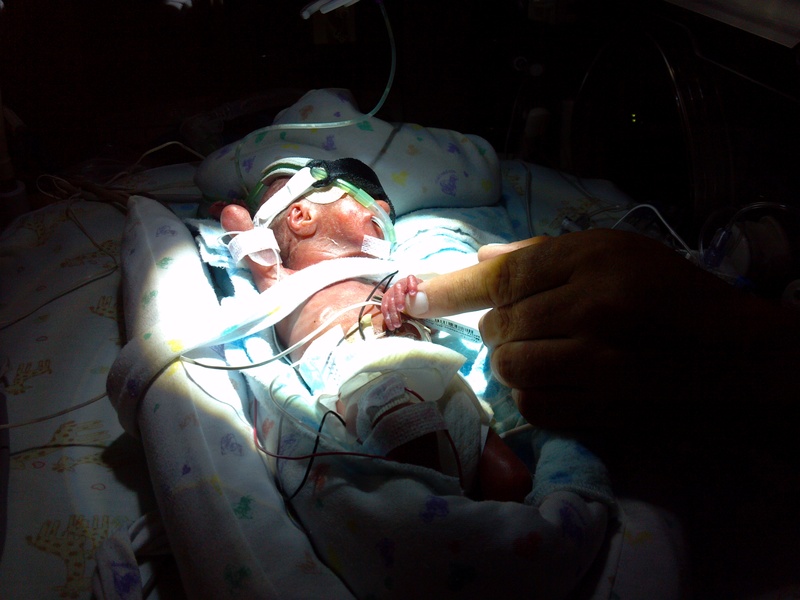 I was used to being surrounded by highly-skilled professionals helping me care for our preemie. How would I, a scared first-time mom, be able to keep my child alive without their help? Ceiling lights whizzed by and I decided to wrap my legs around the bed rails as tight as I could. I was hoping that would keep the baby from being born -- nothing the doctors tried had worked so far. I did not want to meet my baby yet because I did not want to watch it die. When the doctor told me to push, I screamed from the depths of my soul "NO -- I will not have this baby today!" But I did. "It's too small," I sobbed, my cries echoing in the otherwise silent delivery room. After long, tortuous minutes of resuscitation, the doctor declared "It's alive." I still didn't know if I had a son or a daughter. I had just delivered my first child; I had been 23 weeks pregnant. My husband exclaimed "It's a boy!" as he cut the umbilical cord. That was the only normal thing that happened that day. "You have to follow them!" I begged my husband, as our son, who weighed barely more than a pound, vanished through the doorway. Doctors and nurses ran beside his incubator, performing CPR on his tiny body on the way to the neonatal intensive care unit (NICU). I saw my son, Jaxson, for the first time four hours later. I stared, trying to reconcile what I thought a baby should look like with what I was actually seeing. Wires and tubes hid his face. I saw blood pumping through his translucent skin. His eyes were fused shut. His ears weren't fully formed. The neonatologist ushered us into a dingy conference room where the words "4 percent chance of healthy survival" oozed from his mouth and settled heavy in my heart. It should have been one of the happiest days of my life. Instead I spent my son's birthday numb from the fear that he would die. After months of living in the hospital, it was surreal when the doctor told us, "Your son can go home now." On the way to the car, I fumbled with the oxygen tank and monitors. I studied my baby boy, who was still hooked to tubes and wires, and then I looked over my shoulder sure I would see someone running after us yelling "Stop -- we made a mistake! You can't leave!" I couldn't help but think it was my fault. Filled with determination and purpose, I vowed to do anything I could to help my son beat the odds. I became so proficient in medical terminology that doctors asked if I had a medical background (I don't). Being a strong advocate for my preemie was my greatest accomplishment. Selfishly, I thought focusing my energy on appointments, treatments, and therapies would ease my guilt. I was hanging balloons for Jaxson's first birthday party when a helicopter flew over our house. I felt the rumble of the helicopter blades and my breath came in shallow gulps -- I was there. "Please save my baby!" I pleaded, staring into the sharp blue eyes of the EMT. I tasted the fear in my throat when he told me there was a chance I would deliver my baby in flight. I'm not sure how long the flashback lasted, but it left me anxious and confused. Since my son did not die on his birth day, I was convinced that he would die today. Terror wasn't an emotion I thought I would feel on my son's birthday. I was a good mom. My son and I loved and hugged, laughed and played. But as the months wore on, I became consumed with "what-ifs." I imagined, in vivid detail, everything that could go wrong: my son would catch a cold and have to be re-hospitalized, have a serious asthma attack, or have a hard time coming out of anesthesia after surgery. What if he died? One day, I was sitting on the couch thinking about Jaxson's upcoming surgery. My palms started sweating, my breath became ragged and shallow. I was having a panic attack. The helicopter flight, the flashbacks, and this surgery -- it was all the same. The anxiety was in control. I felt Jax's chubby hand as he rubbed my back and stroked my cheek. I choked back hot tears when he said "It's ok mama. I here. I help you." That was the day my life changed. I made an appointment with my doctor for a prescription for anti-anxiety medication. I flung open the curtains and let the sunshine eat up the shadows that had been chasing me since my son's birth. I saw a therapist who helped me process the traumatic events surrounding my son's birth and NICU stay. I learned that delayed onset post-partum depression and post-traumatic stress disorder were common among preemie parents. After months of hard work, I was finally in a healthier place. My son was alive. He was funny, curious and kind. I didn't want to waste another minute worrying about what could be. On Jax's third birthday, I woke up to a cheerful little boy launching himself into my bed for a morning snuggle. We talked about birthday cake, friends and gifts, his eyes growing wider and more excited as we talked. "I happy mama." Jax sighed as he leaned in for a hug. I didn't have any flashbacks that day. I didn't worry about my son dying.